Fertility preservation is a miracle of medical science. It enables infertility specialists to safeguard the fertility of the patient so that they can start a family whenever they want to. The role of a specialist is therefore, not confined to treating male and female infertility issues. It extends to insuring their fertility for the future. Various fertility preservation techniques have been innovated over the years. The patients are recommended the most suitable one according to their individual circumstances and requirements. The reasons why a patient wants to opt for fertility preservation are diverse and have a direct bearing over the technique chosen for them. It is common for people to postpone having children due to educational or career constraints. Adopting fertility preservation makes sure that age-related infertility does not hamper conception when they try years later. It is a ray of hope for cancer patients too because they are likely to lose their reproductive capacity during treatment. However, they can take adequate measures to safeguard it before taking up radiation and chemotherapy. Embryo Cryopreservation or embryo freezing involves freezing of embryos formed using IVF. This method is the most reliable amongst the various fertility preservation techniques and offers a considerably high success rate. The reason is that it is almost half the job done. The woman is made to undergo ovarian stimulation followed by retrieval of multiple, healthy oocytes from her ovaries. The eggs are then lab-fertilized with her partner’s sperms or donor sperms. The healthiest of these embryos are then frozen and stored to be used later. The method is suitable for cancer patients as well as for women who want to halt their biological clock. Those planning to take cancer treatment can adopt this technique before the start of the treatment. The embryos can be thawed and transferred into the woman’s uterus whenever she wants to conceive. Since the first three steps of IVF are already done, getting pregnant with frozen embryos becomes much easier and simpler. Egg freezing is similar to embryo freezing but it involves preservation of eggs rather than embryos. The procedure is done using advanced vitrification (fast-freezing) technique, which is an improvement over the conventional slow-freezing method. The patient is subjected to hormonal stimulation so that she has multiple eggs available for harvesting. These eggs may then be preserved for years till the woman is ready to start a family. Egg freezing is best done during the twenties because this is when their quality and quantity is at its peak. The egg can be thawed and fertilized using IVF/ICSI when the woman plans a family. A ground-breaking fertility preservation technique for cancer patients is ovarian tissue cryopreservation. This procedure involves surgical removal of ovarian tissue. It is then frozen and later, re-implanted when the woman is ready for pregnancy. The method takes only 45 minutes and can be done soon after diagnosis of cancer. So the woman need not delay her treatment as during egg or embryo freezing. This technique is in its evolutionary stages as no children have been conceived with it yet. Hopefully, it will give excellent results in future. Ovarian transposition is another fertility preservation measure used for cancer patients. The ovaries of the patient are repositioned using surgery so that they are not exposed to radiation. It is not always successful because the ovaries may sometimes be damaged by scatter radiation. Pregnancy can be planned later with IVF or by positioning the ovaries back to their original place. Cancer patients may be recommended medical treatment for suppressing their ovarian function during chemotherapy. Using this method, the ovaries are totally shut down during the treatment and the eggs remain unaffected. Ovarian functioning can be resumed with medication after the completion of treatment. The woman has healthy eggs once again and can conceive with them. Gonadal shielding is yet another fertility preservation technique use for cancer patients, both male and female. It involves shielding of ovaries/testes during radiation therapy so that they are not damaged. Male fertility can be preserved for long term by freezing the male sperms under favorable conditions. This measure is effective for both cases, cancer patients as well as those who want to postpone fatherhood intentionally. The sperm sample may be collected naturally or by using testicular sperm extraction technique. The sperm can later be thawed and used for IUI, IVF or ICSI, depending on its amount and quality. Yet another method of male fertility preservation is testicular tissue freezing but it is yet in its elementary stage. A thorough study is required for cases where these options of fertility preservation are to be considered. Primarily, the age, medical complications and reproductive history of the patient are to be taken into account. Patients need to discuss all these options with their specialist to know which one really works for them. 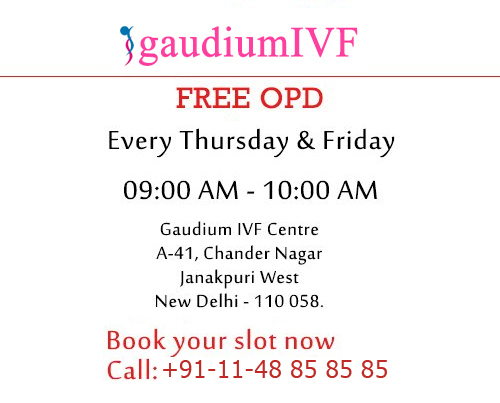 Gaudium IVF is a leading ivf clinic in Delhi where patients are given advanced reproductive care at affordable cost. The clinic brings a plethora of high-tech fertility procedures and excellent gynecological care under one roof. Visit here to get a free second opinion from Dr. Manika Khanna, the top IVF specialist in Delhi.